This is an old picture I uploaded some years ago. I have been awarded as you can see. Excellent photo,colours, tones, details i really like. Regards: Tibor 7/7! This is an old upload of mine. Surely this is one of my best picture. However thanks a lot , dear friend Subhranil ! Thank you so much dear Nicole ! Indeed a wonderful bouquet wit lovely colors!! !Great composition and presentation!! Congratulations on your well deserved SC!!! Finalmente sono riuscito a far qualcosa di valido. Un notevole lavoro per me , sia per ideare il progetto e sia per realizzarlo. Ma tutto sommato sono stato premiato e sono contentissimo. Ti ringrazio per il graditissimo commento. Hello dear friend Hussam ! Un pizzico di fortuna l'ho avuto . Congratulations once again, Armando. Your reply to my original comment really impresses the amount of effort and hard work that can be necessary to produce that perfect image. It looks so simple and straightforward, but your attention to detail has made the difference that places this image above "excellent". I have finally received the high mention. I am happy. I have worked around the project for days, you will understand me. A vase (the one you see) in thin glass. 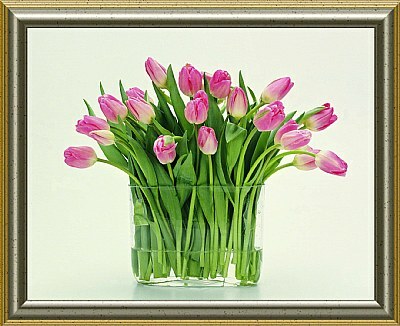 If the glass had been thicker it would have made some malformations to the stems of the tulips. Fresh , fresh small tulips with the sober colors. I have made the turn in whole Vicenza to find them. An enough ample white umbrela to cover the zone to illuminate. A spot of white light to be directed toward the umbrella, so that the white light has been reflected without creating zones of shade or reflected parasitic. A tripod to hold the digicamera well blocked . And then… so much fortune. Thank you friens Gustavo ! You are so kind . Hello Jen , thank you so much. Hi Julie , thanks a lot . Thank you dear frien Anne ! Thank you so much , AJ Miller ! Thank you friend Ambenis ! Thank you so much , Mitra ! Con un po' di fortuna , però. Finalmente ho ricevuto l’ambìto premio . Sono contentissimo. Ho faticato per giorni , tu mi capirai . Un vaso come quello che vedi , in vetro sottile . Se il vetro fosse stato più grosso mi avrebbe reso delle malformazioni ai gambi dei tulipani . Tulipanini freschi freschi dai colori sobri . Ho fatto il giro di Vicenza intera per trovarli. Un ombrellino bianco abbastanza ampio da coprire la zona da illuminare. Uno spot di luce bianca da dirigere verso l’ombrello , che a sua volta mi ha egregiamente riflesso la luce bianca senza creare zone d’ombra o riflessi parassiti. Un treppiedi per tenere ben ferma la macchina fotografica. Ma che bella composizione Armando, bravo! Nicely composed still life, Armando! Excellent colour and composition. Congratulations on the Staff Choice Award, too! Molto ma molto bella questa composizione, complimenti Armando! Well done, Armando! A beautiful, clean shot with a fabulous presentation. I'm happy for you for the SC, and happy for UF that SCs are being awarded again! Hey, things are looking good!